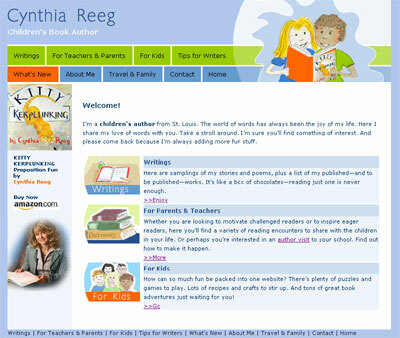 Just launched is a new web site for St Louis children’s book author, Cynthia Reeg. It was important that the site appealed to both teachers/parents and children. We created a clean template with a bright and breezy color palette and peppered it with hand custom hand drawn illustrations that were a lot of fun to do! The site also has a custom blog which already has a couple of entries including a fabulous testimonial ..thank you Cindy!